There are conferences tailored for specific audiences like marketers, women entrepreneurs, and even blockchain enthusiasts, but there’s another big industry that deserves the spotlight for its innovative events—design. Gone are the days of boring design presentations in stuffy conference rooms, these days design-focused events are bringing together creatives/designers from across the globe in fun, creative, and interactive environments. 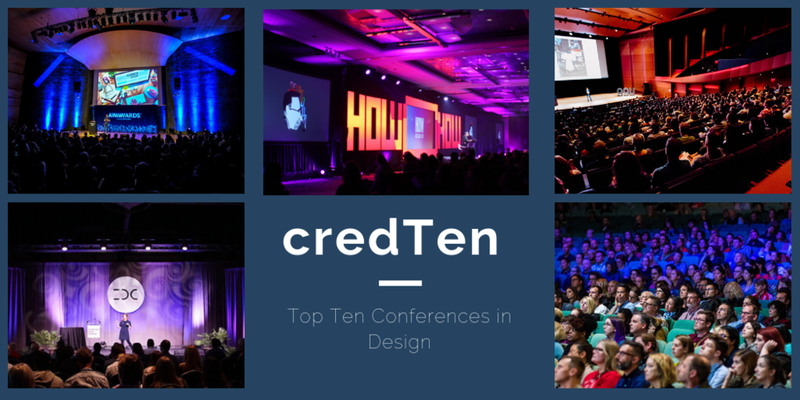 In this edition of our credTen series, we’re featuring the top 10 events worth checking out for designers and creatives. Similar to SXSW but for designers/creatives, Interaction is a week-long event that hosts an Education Summit, leadership retreat, workshops, and culminates with a three-day conference. Focusing on “Design in the Wild” the 2019 event gathers designers from across the world to explore the edges of interactive design. Started in 2012 in collaboration with the Harvard Graduate School of Design, Harvard Business School, and Harvard College, xDesign brings together over 500 creative thinkers, students, and notable designers to discuss the impact of design across industries. AIGA is back this year! This annual conference, which skipped 2018, brings together practitioners, researchers, and academics to discuss how design is changing and the impact it has on their fields. An hour away from Atlanta, on the border between Georgia and Alabama, sits Columbus, South Carolina, home to Creative South. With a focus on the process and experience of design, this three-day conference gives designers actionable insights and takeaways they can use in their own practices. Starting out as the HOW magazine in 1985 (which still exists today) HOW has transformed itself into one of the premier design events in the world. In May, over 4,000 attendees will converge in Chicago for four days of discussion around all things design and branding. 99U is a two-day conference that brings together over 1,000 designers, creatives, entrepreneurs, and researchers to help them supercharge their work and make their big ideas happen. Featuring past speakers like Seth Godin, Simon Sinek, Brené Brown, and others, this conference is one that creatives/designers simply can’t miss. Held in both Vancouver in the spring and Toronto in the fall, RGD's DesignThinkers is Canada's only annual conference for visual communicators. Over two days, attendees will gain in-depth insight into trends and best practices in branding, design thinking, and design management. AWWWards, the most-visited digital design awards platform in the world, is coming back to San Francisco for their summer conference. Featuring speakers from the likes of Dribbble, Google, and Airbnb, this two-day conference aims at helping designers and developers discover trends, new technologies, and the secrets of the Internet. Hailed as “A New Kind of Design Conference” IDSA’s Interaction Conference discusses the power of design. With speakers like the VP of Design at Fitbit, Director of Global Design Innovation at PepsiCo, Inc., and many others, this conference brings together diverse perspectives to discuss the future of design. Part design, part marketing, and part general tech, Seattle Interactive Conference brings together the best of each world. With speakers like Jeff Miller, Head of Creative Strategy at Snapchat; Alex Chung, CEO of Giphy; and our cred speaker Jeremy Bailey, Creative Director of Product at FreshBooks, this two-day conference needs to be on your list. In the past year, blockchain has been called both a “tech breakthrough” and “the most over-hyped technology” of our generation. With tangible use cases across financial services, healthcare and supply chain, however, blockchain is more than just a buzzword; blockchain is changing the foundation of our global economic system. In this edition of our credTen series, we lay down 10 events in blockchain worth checking out. A global hub for blockchain and distributed ledger technology projects, Switzerland––specifically, Zug––is also home to the celebrated Crypto Valley Blockchain Conference. The event sees 600 attendees over three days of content, bringing together scholars, researchers, executives and government officials to discuss real-life applications of blockchain technology. Bridging blockchain hotbeds of Asia and Silicon Valley, Blockchain Connect features international speakers and attendees, a demo and pitch stage, a hackathon and a career fair. “Catch the Next Crypto Unicorn” is the event’s tagline. Partners include Draper Dragon, Huobi Pro and ConsenSys. The Distributed event series gathers global technologists, digital disruptors and industry leaders to explore how blockchain technology will shape the future. Distributed is the flagship event and includes an enterprise track on the foundations of distributed business, as well as a technical track covering tokenization and protocols. Powered by leading cryptocurrency publisher CoinTelegraph, BlockShow showcases the industry’s most groundbreaking solutions and brings together businesses with blockchain. On the heels of a thrilling Europe event, BlockShow is coming to the US this summer and hosts an Asia edition as well. Keynote produces the longest-running financial conference for the bitcoin, blockchain and currency industries. In its fifth year, World Blockchain Forum hosts editions in London, Dubai and New York, and draws an intimate audience of 350 senior executives, investors and government officials. Focusing on the business and technology of blockchain, Token Fest covers topics like the state of the token-based economy, applied cryptography, smart contracts and scalable DApps. With 4,000 attendees and 200 speakers, the Boston edition is slated to be 2x bigger than its inaugural event in San Francisco. Deconomy gathers global thought leaders, investors, entrepreneurs, and academy and policy groups to discuss the future of distributed economy. In 2018, Vitalik Buterin and David Chaum graced the stage, and spoke on topics like peer-to-peer cash systems and building and scaling Ethereum. A two-day conference featuring international cryptocurrency and blockchain experts and entrepreneurs, UNCHAIN 2018 gathered an intimate audience in Hamburg for quality content. Speakers debated the impact of cryptocurrencies and socio-economic frameworks for blockchain and beyond. Token Summit explores the token-based economy in depth. The 3rd summit in 2018 discussed token regulation, security tokens, and best practices for protocols and crypto-assets. Held during New York Blockchain Week in 2018, CoinDesk’s annual blockchain conference drew more than 4,000 enthusiasts from Silicon Valley, Wall Street and overseas. Despite a hefty ticket price and lambos displayed outside the venue, Consensus is where the crypto world goes to be seen. Bonus: Hosted by Brian Fabian Crain, Sebastien Couture and Meher Roy, Epicenter publishes weekly interviews with leading minds in blockchain. Laura Shin’s Unchained Podcast is another source of influential talks with industry pioneers. Wondering where to go this year to increase your marketing know-how, discover where the industry is heading, and expand your thought leadership? 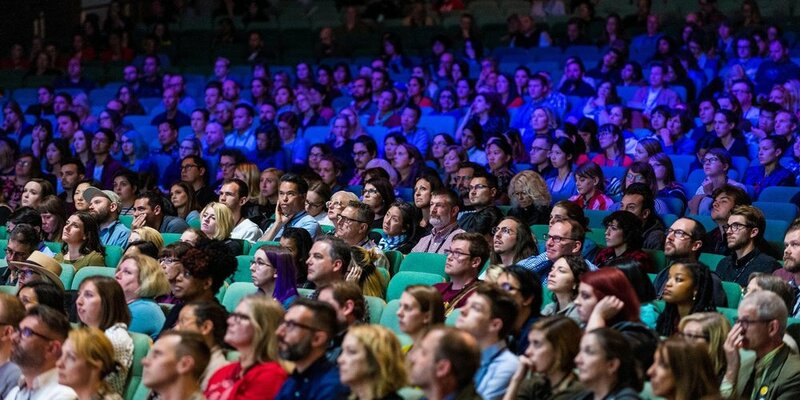 Look no further than our roundup of 10 marketing conferences worth attending in 2018. A must-attend for performance marketers managing the complex sales cycles and group buying realities common in B2B industries, B2B Marketing Exchange addresses account strategies, messaging frameworks, demand acceleration, and sales enablement during 85+ sessions in sunny Scottsdale, AZ. Social Media Examiner’s 3-day gathering of thought leaders is designed for social media marketers, influencers, and content creators including bloggers, video creators, and podcasters. This year’s speakers include former Apple evangelist Guy Kawasaki, Facebook expert Mari Smith, social futurist Brian Solis, Snapchat influencer Shaun McBride, and Instagram expert Sue B. Zimmerman. LiveRamp’s annual martech conference gathers nearly 1,000 executive-level attendees in one place to discuss the challenges and solutions facing the industry today. Speakers include TripAdvisor CMO Barbara Messing, SafeGraph CEO Auren Hoffman, AppNexus CEO Brian O’Kelley, AdRoll founder Aaron Bell, and Target VP of Digital Media Brent Rosso. With 95% of attendees saying they received practical information and 93% saying the event met or exceeded their expectations, Adobe Summit is a good bet for advertisers, campaign managers, content managers, digital marketers, and publishers who want to learn how to use the latest tools and technologies to build campaigns, manage their advertising, and gain deep data insights. There’s no shortage of conversations around how AI is set to transform the marketing industry. Digiday’s AI Marketing Summit will dive deep into how marketers can understand and use AI and machine learning. Expect sessions on topics like predictive merchandising, voice assistants, and chatbots, plus a number of afternoon activities and evening networking receptions. For all things content marketing and storytelling, head to Cleveland for Content Marketing World, which features more than 120 sessions and workshops presented by leading brand marketers. 2017 featured speakers included GE CMO Linda Boff, and actor Joseph Gordon-Levitt. Tickets: Main conference starts at $999. HubSpot’s INBOUND grew to 21,000+ attendees and 250+ educational sessions last year, and is expected to be even bigger in 2018. INBOUND’s purpose is to provide the inspiration, education, and connections marketers need to grow and transform their business. Past keynote speakers include Michelle Obama, Brené Brown, John Cena, and Arianna Huffington. MarTech’s USP is that it’s a tech conference for marketers and a marketing conference for technologists. With tracks for marketing, technology, management, and solutions, the conference aims to help the leaders who recognize the synergies between these disciplines drive change and accelerate convergence within their organizations. Now in its 15th year, AdWeekNYC brings together leaders from marketing, advertising, technology, and creative spaces for a week of thoughtful conversations around the trends, challenges, and opportunities shaping the industry today. Daytime programming includes seminars, workshops, and leadership breakfasts. Past evening events have included performances by Avicii, Snoop Dogg, and Amy Schumer. Produced by Tech Media Co, which also puts together the Digital Summit Series, Internet Summit features 90+ sessions and workshops to help digital marketers stay ahead of the latest trends and provide practical, game-changing takeaways they can immediately apply to their marketing strategies. 2017 speakers included marketing gurus Seth Godin and Ann Handley, as well as Netflix co-founder Mitch Lowe. Jason Lemkin’s SaaStr Annual is the go-to event for players in SaaS. This event brought together CEOs, entrepreneurs, investors and veterans for tangible, non-Google-able lessons that the audience loved. Our clients 6sense, Foundation Capital, TapInfluence, and Expensify had the opportunity to grace the stage in 2017. In 2018, we’re excited clients from FreshBooks, Canvas Ventures, Ridge Ventures, and Foundation Capital will join the lineup. Over 2,100 attendees flooded The Fairmont Hotel for LiveRamp’s annual conference to listen to the brightest minds in MarTech. With quality content and exciting networking opportunities, a handful of our clients came together to discuss the power of connectivity and data-driven marketing. We are continually impressed by our speakers from Unacast, Reveal Mobile, Kespry, Drawbridge, Legendary Entertainment, SafeGraph, Voicera, Cathay Pacific, Bullpen Capital, and Ridge Ventures. From Design Driven and Data Driven, to Code Driven and Hardwired, FirstMark Capital’s series of NYC events draws the crème de la crème of tech speakers. In 2017, we had Kespry CEO at Hardwired, MapD and Voicera CEOs at Data Driven, and Steve Vassallo, General Partner at Foundation Capital, at Design Driven. Australia is an emerging market for a number of our clients and Mumbrella360 has been THE event that brings together the entire marketing ecosystem. It’s an extremely well-organized show that our clients like MightyHive and MuteSix highly recommend. Beer in hand at Pizza & 40s, David Barrett, CEO of Expensify was joined by the founder of The Hustle, Sam Parr, to share the ups and downs of his entrepreneur journey. 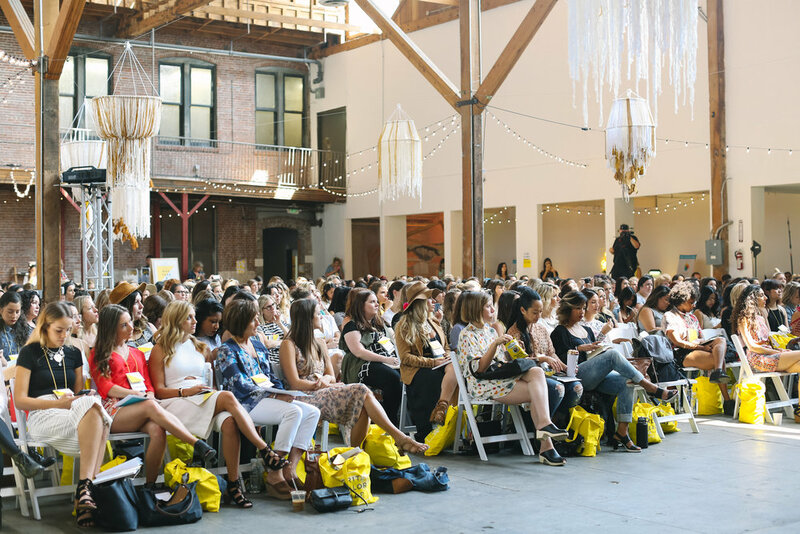 We’re thrilled to also have our badass women speakers from 500 Startups, LiveRamp, Lightspeed Venture Partners, and Tophatter speaking at The Hustle’s 2X events in 2018. The Economist’s inaugural Sustainability Summit drew more than 200 leading business executives, policy makers, and investors to discuss sustainable development in the face of rapid global change. Senior Editor Matthew Bishop moderated a conversation with our client Philippe Lacamp of Cathay Pacific Airways. With 30+ years under its belt, Mobile World Congress continues to reinvent itself as the global hub for mobile, telecommunications, IoT and more, gathering nearly 108k attendees in 2017. Life360, Boxever, 500 Startups, and Drawbridge spoke to conversational commerce, marketplaces, advertising, and startup trends. Mobile World Congress Shanghai and its US debut - Americas - are also worth checking out. Shanghai and Americas editions drew nearly 67.5k and 21k visitors respectively in 2017. Described by many as “Burning Man meets TED,” Slush has expanded globally from its 20,000-person flagship show in the Arctic Circle to Shanghai, Tokyo, Singapore, and more to come. Our clients Tophatter and 500 Startups spoke on discovery commerce and fundraising globally. Money20/20 brings together the who’s who in payments and financial services. It's the largest event in the finance space, where we placed Ben Black of Akkadian Ventures, David Barrett of Expensify, and Charles Moldow of Foundation Capital in 2017. In 2018, we’re also excited to continue working with sister events Shoptalk (feat. Hawke Media, Sphero, and Instacart) and HLTH (feat. Enigma Technologies and Ayasdi). Held annually since 2009, Web Summit has been called "the greatest tech show on earth" and "Davos for geeks," and continues to exceed expectations for our clients each year. From speaking in front of hundreds (sometimes thousands), to private dinners and networking with the likes of Al Gore, we’ve only heard glowing feedback from our clients Unacast, Enigma, Kespry, ChannelSight, and 500 Startups. And that’s a wrap for 2017! In 2018, we’ll be doing a number of Top 10 conference roundups, so watch this space for the best events you should attend and/or speak at.